It's only been in recent years that I've found my love of scones, and I have no idea why I went so long without them! I've only ever had freshly baked scones from going for afternoon teas, and it had never really crossed my mind that shop bought scones would be any different. 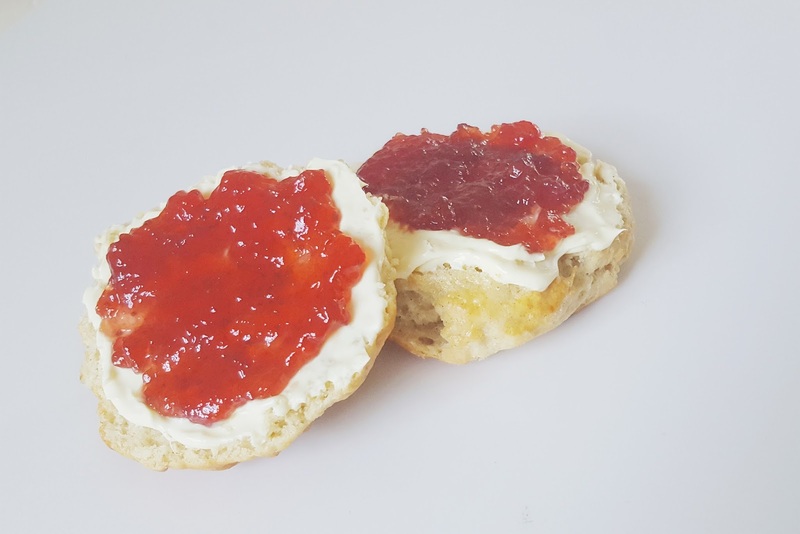 This Easter I wanted to serve scones, cream and jam for dessert on Easter Sunday but when I picked them up at the supermarket, the scones felt really heavy, thick and doughy. Scones to me are light and fluffy so I decided to make them myself, which was definitely the best decision! Yet again, another really simply recipe for you to try at home. These scones may not look as perfectly shaped as they did in the supermarket but they were light fluffy and even better, warm! Preheat the oven to 220°C/425°F/gas mark 7. Lightly grease and/or line two baking trays. Put the flour and baking powder into a bowl. Add the butter and rub it in until the mixture resembles fine breadcrumbs. Beat the eggs together and make up to 300ml (10fl oz) with the milk, then put about 2 tbsp aside in a cup for later. Gradually add the egg mixture to the dry ingredients, stirring it in until you have a soft dough. Turn the dough out on to a lightly floured surface and flatten it to a thickness of 1-2cm (½-1in). Use a cutter to get perfect shape scones. As you can probably tell from my photos, I didn't have a cutter, so I split the mixture into even size balls, flattened and then made as round as physically possible! I have to say they didn't all look perfectly aesthetically pleasing so if I make these again, I'll definitely be investing in a cutter! Arrange on the baking trays and brush the tops with the reserved beaten egg mixture to glaze. Bake for 10 to 15 minutes, until well risen and golden. Now begins the argument of cream or jam first...? Let me know if you give these a try! They are amazing if I do say so myself!